Over the last 20 years, three major urban projects in Rio de Janeiro’s favelas—slum neighborhoods—have failed to succeed in the long run, despite initially drawing international acclaim. These projects—Favela Bairro, Projeto de Aceleração de Crescimento (PAC), and Morar Carioca—were all intended to revitalize favelas throughout the city. For example, Favela Bairro, developed by renowned architect and urban designer Jorge Jauregui, was the first of the three, and brought vital infrastructure to the favelas—including basic upgrades such as paved alleyways and sewage lines. Although this gave the favelas basic neighborhood upgrades, residents were not taught how to use it, and after 20 years of misuse, much of the original infrastructure is gone. The project failed in the long term due to one single governance problem: monitoring. As Jorge Jauregui explained during my field research in Brazil, local governments often develop infrastructure in favelas without preparing the community to operate and use it as intended. For example, many community buildings are no longer used for their original purpose and constant maintenance is required. Not yet comfortable with their new surroundings, community members do not understand how to maintain the infrastructure they receive, given the lack of guidance. The government’s absence can also lead to the rise of drug dealers, who fill the gap by actually providing urban services and maintaining order. As a result, projects and programs end up failing to provide the intended benefits, and the investment is lost. This is why governance matters. Favela Bairro could have been a successful program in the long run. 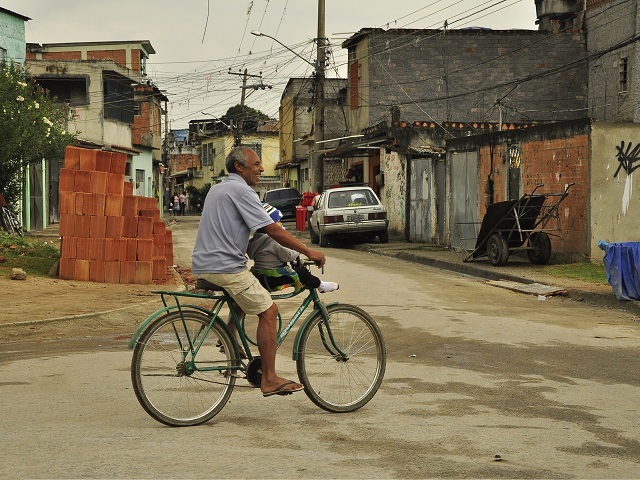 PAC and Morar Carioca—follow-up projects created years later—would not have been necessary except for simple expansions to additional communities. However, the model lacked good governance, as there was no participation from the public, residents did not have access to the information they needed, and the local government failed to monitor for results after implementation. Cities can’t develop into sustainable communities without the support of good governance. There are five key factors for making cities work: access to information, public participation, institutional capacity, accountability, and resilience. These categories encompass a range of issues related to urban governance, such as how well urban land markets function, how transparent government agencies are, and how much civil society participates in local governance. 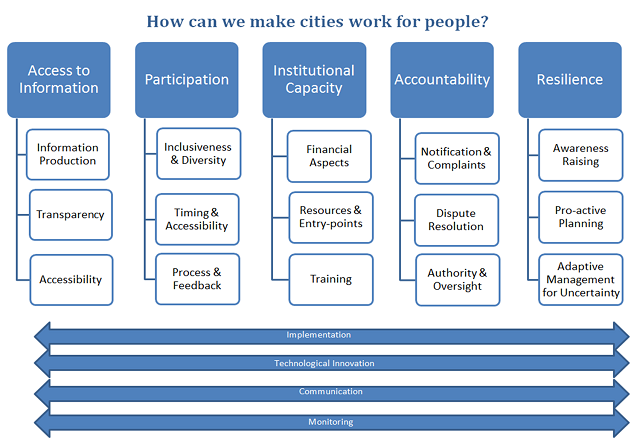 A framework for thinking about urban governance. Graphic by Maria Tigre. Many cities struggle to achieve their commitments to sustainability. However, reforming the ways that our cities are governed can provide an easier path to get them to work. By laying the right foundation and preparing all stakeholders involved to do their part, we can create resilient, sustainable cities that are better prepared to be successful in the long run, instead of only efficient models for the present. The idea is to lay the proper foundation for creating cities as strong as the buildings that make them up. For the following weeks, I will explain each category, the paths that we can use to reach them, and the cross-cutting axes that support them. It is important to note that although this framework indicates possible answers, it is not an exhaustive list. There are many ways to achieve good urban governance, and this is only a starting point for thinking about how we can make sustainable cities a reality worldwide. For the next installment of From Ideas to Implementation on why access to information matters for good urban governance, click here.